Head-on automobile crashes are some of the more deadly accidents people can be involved in. According to the National Highway Transportation Safety Administration (NHTSA), although head-on collisions cause only 2 percent of all crashes, they cause almost 10 percent of fatalities—2,895 in 2012. Even when the drivers are driving at a slow speed, these accidents can cause devastating injuries when the victims survive the crash. Why Are Head-On Collisions More Likely to Cause Fatalities? Head-on crashes occur when the front ends of two vehicles collide. Even when the vehicles are equipped with air bags, the abrupt stopping movement when the vehicles collide into each other can be like smashing into a brick wall. When the vehicles are traveling at high speeds, the victims are more likely to suffer catastrophic injuries or death. Driving the wrong way. 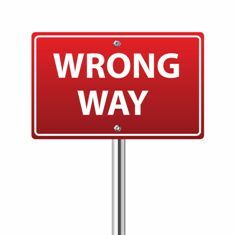 Many of these crashes happen when a driver is driving the wrong way on a street or a ramp onto or off the highways. These accidents can be especially deadly on highway ramps because the unsuspecting driver has nowhere to go. Crossing the center line. When a driver drifts across the center lane of a road, a head-on crash is the likely result. Passing incorrectly. A driver can easily smash into another automobile if he is passing in a no-passing zone or misjudges that he has sufficient time to pass when passing is permitted. Aggressive and impatient drivers are often the ones who make these negligent mistakes. Driving when fatigued. If a driver is drowsy or actually falls asleep at the wheel, he can veer into oncoming traffic in a split second. Speeding. Speeding around curves is especially dangerous and can cause a driver to lose control of his vehicle, resulting in him hitting another vehicle head-on while he battles to regain control. Driving while intoxicated. Drivers who are intoxicated due to alcohol or drug use have reduced driving skills in general and can make tragic mistakes, like falling asleep at the wheel or going the wrong way on a road or highway ramp. Distracted driving. Driving when talking on a cellphone, texting, eating or drinking, or engaging in another type of distracted driving reduces a driver’s focus on his driving and the road. He can drift into oncoming traffic in the few seconds his eyes and mind are focused on other matters. Failing to follow signs. Some head-on collisions are caused when drivers fail to follow road signs—especially common when a driver is intoxicated, drowsy, or distracted. What Injuries Could You Suffer in a Head-On Collision? Were you injured in a head-on collision? Was a loved one killed? You need an experienced car accident attorney who can preserve crucial evidence before it is destroyed and negotiate a settlement with the insurance adjuster for the negligent driver—who will fight to pay you as little as possible. Christopher Hudson is here to help. He used to work for the insurance industry before he began representing victims like you and knows the adjusters’ strategies to reduce or deny your claim. Start an online chat or call our firm today toll free at 888-795-6261 to schedule a free, no-obligation evaluation of your case.